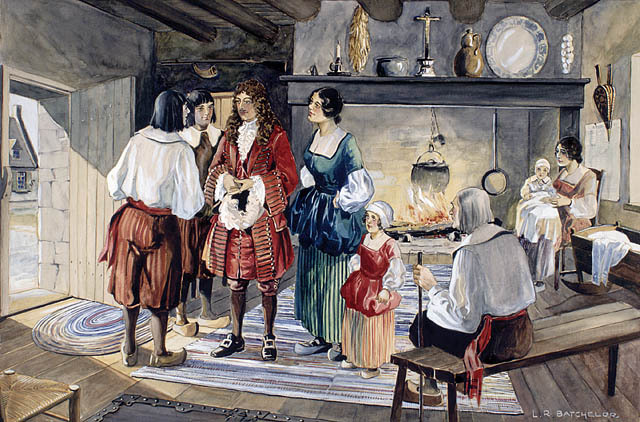 In the early 1660s, New France was facing many challenges. It had been weakened by 20 years of fighting against the Iroquois and the far-reaching powers of the governor. It was time to reorganize New France, and so Louis XIV, along with Jean-Baptiste Colbert, his minister responsible for the colonies, decided to take action. In 1663, New France became royal property. The governor’s powers were reduced, and the colony was reorganized administratively. An important role was given to the Intendant, as representative of the King, in the administration of justice, police and finances. On March 23, 1665, Louis XIV appointed Jean Talon to the position of Intendant. Almost 40 years old at the time, Jean Talon had been educated by the Jesuits in Paris, and he had an excellent reputation as an administrator. He had held various administrative positions in the French military and had become the Intendant of the County of Hainaut in 1655. Jean Talon held the position of Intendant from 1665 to 1668 and from 1670 to 1672, putting in place many initiatives that greatly improved conditions in the colony. First, he worked to increase the population by promoting immigration, encouraging and supporting large families, urging single people to marry, bringing over the filles du roi, motivating soldiers to settle in the colony after their military service, etc. Talon encouraged people to settle permanently by making it easier to access land, but also by forcing them to live on the land. Added to concession contracts were specific clauses requiring settlers to clear the land and “keep hearth and home” within 12 months, and prohibiting them from selling the land until there was a house built on it and two acres had been cleared. Talon also oversaw the reorganization of the legal system; he reduced the number of trials by fostering accommodations, promoting out-of-court settlements and asking that cases at the first level be brought before him directly. In terms of the economy, Talon was a visionary: he dreamed of factories in New France producing textiles, rope, tar, potash, soap, etc. He conducted mineral exploration around Trois-Rivières, a prelude to the Forges du Saint-Maurice in the 18th century, worked toward creating a network of alliances for the fur trade, and built a brewery in Quebec City to produce local beer. By the time he left, the face of New France had changed dramatically! Library and Archives Canada holds copies of many historical documents written by Jean Talon, including his memoirs and observations on the state of the colony, correspondence, and the censuses held in 1666 and 1667. This entry was posted in Census, Politics and Government and tagged colonial history, Filles du Roi, Jean Talon, New France by Library and Archives Canada Blog. Bookmark the permalink.